During pilot season, June Dietz's husband Mitch Gold becomes another man—a man who doesn't notice her delicious Farmers Market homemade dinners, who mumbles responses around the tooth-whitening trays in his mouth, who is consumed with envy for his fellow television actors, who pants for a return phone call from his agent. And who wants to be married to an abject, paranoid, oblivious mess? Possibly not June, whose job as a poetry professor at UCLA makes her in but not of Los Angeles, with its illogical pecking order and relentless tribal customs. Even their daughter Nora's allegedly innocent world isn't immune from one upsmanship: while Mitch is bested for acting jobs by the casually confident (and so very L.A.) Willie Dermot, June is tormented by Willie's insufferably uptight wife Larissa and the other stay-at-home exercisers in the preschool. Could Rich Friend be the answer? Smart, age-appropriate, bookish—and a wildly successful television producer—Rich focuses on June the way nobody has since she moved to Los Angeles, and there's nothing for June to do but wallow in what she's been missing. But what's the next step? How does a regular person decide between husband and lover, family and fantasy? Set in a Los Angeles you haven't read about before, Beverly Hills Adjacent is that rare thing: a laugh-out-loud novel with heart. 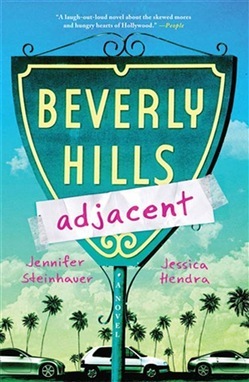 Acquista Beverly Hills Adjacent in Epub: dopo aver letto l’ebook Beverly Hills Adjacent di Jessica Hendra, Jennifer Steinhauer ti invitiamo a lasciarci una Recensione qui sotto: sarà utile agli utenti che non abbiano ancora letto questo libro e che vogliano avere delle opinioni altrui. L’opinione su di un libro è molto soggettiva e per questo leggere eventuali recensioni negative non ci dovrà frenare dall’acquisto, anzi dovrà spingerci ad acquistare il libro in fretta per poter dire la nostra ed eventualmente smentire quanto commentato da altri, contribuendo ad arricchire più possibile i commenti e dare sempre più spunti di confronto al pubblico online.